DESCRIPTION PRIME LOCATION, LAKE, SHOPS. OVERSIZED HEATED GARAGE, HUGE YARD! This immaculate home is in new condition! Located in a quiet cul de sac across the street from the Mahogany Lake Beach and is ready for new owners! You will be welcomed by gleaming floors, 9 ft Ceilings, a large living area complete with gas fireplace for all of your cozy evening spent. The Kitchen is gourmet with upgraded cabinets, beautiful granite countertops and great stainless steel appliances. The eat in Kitchen leads directly out to the deck and exceptional stamped concrete patio with is perfect for entertaining. The private, pie shaped, south facing yard is oversized and perfect for a growing family to enjoy all year. The upstairs boast a large master suite complete with a ensuite and walk in closet. The 2 additional bedrooms which are the perfect size for kids or guest. Top this off with a 2 floor laundry, Heated, Insulated, Drywalled, Oversized DREAM Garage, walking distance to all the best Mahogany amenities! Furniture included: 3 piece sectional and black ottoman, Black wood rocking chair, Black glass top Rectangular Kitchen Table and 6 chairs, Futon and night stand, 55'' mounted TV and sound bar above the fireplace, mirror in Master bedroom. Home for sale at 119 Mahogany Ro Se Calgary, Alberts T3M 1S9. 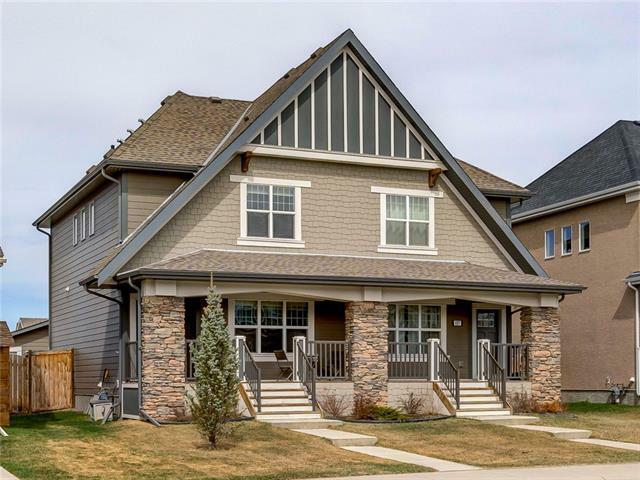 Description: The home at 119 Mahogany Ro Se Calgary, Alberta T3M 1S9 with the MLS® Number C4209735 is currently listed at $424,888.